Not so , during the celtic tiger years when our GDP was at its peak , we had huge hospital waiting lists and people on trolleys waiting for surgery etc , as opposed to the 80s when GDP was much lower but yet these problems were not as bad . and we can't ever devalue to increase the attractiveness of our exports. The Euro and the EU are at the root of many of our problems including allowing lying saudi sponsored terrorist dickheads like Halawi and harati to travel here freely. 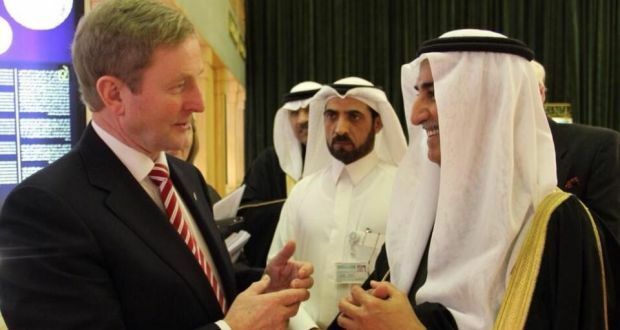 Fine gael are no help either as they back the EU unaccountable corrupt scum to the hilt and when they are not busy doing that against the interests of the Irish people, they are busy doing sweet deals with the saudis to approve the building of more sunni mosques to put their little friends in and radicalise others and their kids in. Not so - we had hospital waiting lists and people on trolleys because we had incompetent government not immigration. Running the hospital system into the ground is stage one in the privatisation agenda. This is all quite deliberate. You only have to look across the water to see the tories doing exactly the same to the NHS. It ain't coincidence. Only a fool would think that. So I totally disagree. The fact is the government ARE competently doing their job. i.e. serving their own ideological interests and those of their sponsors. However they certainly aren't serving us. A fine taqqiya performance, though to any non-naive people watching they would have noted he was full of it. Far too much "a grá mo chroí" slabbered on. And far too many, practically a list of "I'm Irish too, contrivances" worked in there. With his contrived put on Dub accent, his 'Irish Identity' signal dropping, "I was born in the Coombe" "Christian Brothers" and ticking off his previously prepared checklist of how Irish he is, how like every other Irish person. I'm Irish I am, really I am. One day just like every other Irish lad off on his holidays, I was headed to Ibiza, yes, yes, just like all the other young Irish lads, Allah bless 'em, when all of a sudden I just found myself in Egypt, imagine that.....in Egypt at the head of a rally, in Egypt at the head of a rally, a protest of 100s of 1000s protesting the government. Funny thing that, about holidays, they're like chocolates, you never know what you're going to get. This individual is the epitome of how islam operates. A liar and a whining bully. When they are in a weak or vulnerable position either on the street or as a conquering horde, they play the weak "poor poor me" victim, they vie for pity and leverage to throw off and dilute the advantage of power the enemy has over them. They bide their time, and try to gain more power and a stronger position, when they have that, the smile and "poor poor me" victim charade drops and you are faced with a snarling cruel predator and a predatory system that is there to kill you or conquer you and bully you into submission. It is a cult of the bully, by the bully and for the bully. What you are witnessing here is a well prepared lie, he is practising taqqiya, using his lie in an opportunity of strategic manipulation to propagandise the Irish public towards islam and mass-immigration. This is what islam has done since it's inception on the Saudi peninsula. This individual will be trouble for Ireland and the West at some future date. N.B one crucial slip by Tubridy when he said to Ibrahim, so you don't ever want to go back to Egypt.....YOUR HOME COUNTRY. You could hear the palpable realisation from Tubridy as he let that slip, trying to move quickly over it. That sums it up in a nutshell. As soon as they reach critical mass he will not longer be Irish but a Muslim. Then the Irish will have a choice, fight or accept servitude and being gelded. That will be the end of the Irish race. And who is to say that it is not a good thing as collectively as a nation they are too stupid to survive. Time will tell, and not too much time either with the way things are going. I would point out that if the examples of Sweden and other places more advanced along the curve is any indication, it is not looking too good. I read that when his release was announced, quite a few Irish gays and liberals logged into a social media page that he had used before he went to Egypt in 2013. They were quite shocked to find homophobic comments he had made back then. or apostasy or the murdering of coptic christians by the MB either! All this nutty hyper-orwellian regime antics must be pushing people to the edge. The NP best get prepared for a recruitment influx. I celebrate a coming together of cultures. I celebrate love. You think Islam will bring love? Misguided hardly fits the bill there. Yeah ..have to say I just don't buy that ..you could see that Tubbs was veeeery sceptical ..
Got something there Porter, the Ibster is more than meets the eye. No because GDP rises with immigration to a country - I have listed several sources on this before. Useless immigrants. GDP down around 60 billion in two years. I'm in favour of immigration. Immigrants that work and contribute and integrate. Not the useless kunts that leach and seemed to be encouraged by the liberals. And increasing GDP is not necessarily a good thing in itself - if you have most of the money going to a tiny landlord ruling class and to the migrants in the form of dole, health care, education, free housing, etc. etc.